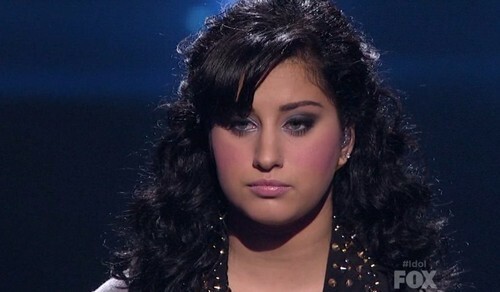 Jena Irene sang, “So Small” by Carrie Underwood this week for her Country song choice. Tonight we got double the performances from the Idol hopefuls as they sang both a Country and a Rock n Roll song in their bid for America’s votes. Did you see Jena’s Rock & Roll song? If you missed it we have the video, right here. The Top 6 will really have to bring their A game tonight to stay around for another week, we expect a higher level of performances as the contestant pool diminishes as we head towards the May finale. Did you watch tonight’s performance show? Just in case you missed tonight’s show we have you covered and you can read our full and detailed recap here! On the next live results show airing Thursday, one contestant will be sent home. The show airs at a new time and a shorter show duration just 1/2 hour. There will be no judges save this week the only one of the season was already used. Check out the video below and let us know what you thought of Jena Irene’s performance? Was it enough for her to move on to next week’s show? Did you miss any of the other artist’s performances? If you did, you can see them all HERE! Sound out in the comments below and let us know your thoughts were of tonight’s Idol Top 6, Performances.